This is the guide for software developers and testers to understand and start working on the very famous Agile SCRUM methodology for software development and testing. Learn the basic but important terminologies used in the Agile Scrum process along with a real example of the complete process. We have listed all the Agile Tutorials in this series for your convenience. Hope they will be of immense help to you. Let's start with the first tutorial in the series – Agile Scrum Introduction. Introduction to Agile: What is Agile Development? How the Process is done? An Example! Agile is one of the world’s most widely used and recognized software development framework. Most of the organizations have adopted it in some form or the other but there is still a long way to go in the maturity of their adoption programs. The sole aim of this series of tutorials is to onboard technology and non-technology professionals into the Agile World. We will take you through the agile journey in a step by step manner until you understand the philosophy behind using Agile, its advantages and how to practice it. This series aims to equip and enable the readers to apply Agile and Scrum learning into their work. This particular tutorial is dedicated for explaining to you why there was a need for Agile and how it got created. The fundamental here is to make you understand the concept of Agile Adoption in Software Development Industries. Agile was born when on one fine day when 17 people with differing development methodologies background, got together to brainstorm if there was a possible alternative solution to software development which could lead to faster development time and was less documentation heavy. At that time, software development used to happen so long that by the time projects were ready to be delivered, the business had moved ahead and the requirements had changed. Thus a project was not able to meet the business needs even if it was able to meet its defined objectives. Thus these champions of different software engineering techniques got together and the end result of their meeting was what they called the “agile manifesto’ which we will be discussing in detail in the next tutorial of this series. But the agile that was born that day is not what we see today in organizations. The methodology those experts agreed upon was described as ‘lightweight’ and fast. But the main win out of this meeting was the thought that faster delivery of a product and constant feedback were the keys to achieve success in software development. The existing waterfall techniques were too cumbersome and had no provision for feedback until the final product was ready to be delivered. This meant that there was no scope for course correction and the customer had no view on the progress until the whole product was ready. And that was what these experts wanted to avoid. They wanted a solution which would have a scope for constant feedback in order to avoid the cost of rework at a later stage. The existing waterfall techniques at that time were too cumbersome and had no provision for feedback until the final product was ready to be delivered. It was called a waterfall model of development because the teams first finished one step completely and only after that they moved ahead to the next step. This meant that there was no scope for course correction and the customer had no view on the progress until the whole product was ready. And that was what these experts wanted to avoid. They wanted a solution which would have a scope for constant feedback in order to avoid the cost of rework at a later stage. And that is why agile is also about being the adaptive and continuous improvement, as much as it is about constant feedback and speed of delivery. Agile is not only about applying the set practices in developing a software. It also brings in a change in the Team’s mindset which drives them towards building a better software, working together and eventually landing them a happy Customer. Agile values and principles enable the team to shift their focus and change their thought process of building a better software. Agile is not a set of rules. Agile is not a set of guidelines. Agile is not even a methodology. Rather, Agile is a set of principles that encourage flexibility, adaptability, communication and a working software over plans and processes. It is very succinctly captured in what is called the agile manifesto. Agile software development allows the team to work together more efficiently and effectively in developing complex projects. It consists of practices that exercise iterative and incremental techniques which are easily adopted and display great results. In apply Agile into action, we have various Agile-based methods and methodologies. These methods and methodologies cater all the needs of a software development industry right from the software design and architecture, development & testing to project management and deliveries. Not just that, Agile methods and methodologies also open a scope for process improvement as an integral part of each delivery. There are various Agile Methodologies that are in practice in various diversified industries. All these methodologies focus on lean software development and help in building better software effectively and efficiently. That is all with Agile Introduction. The part is structured to help you to understand the core values and principles that shall be adopted for a team to be working in an Agile mode and mindset. As we all know, Agile is a software development methodology. We have also learned about the values and principles which were mentioned in the agile manifesto by the founders of agile. In our initial discussions, we also skirted upon the differences between agile and the traditional waterfall models. In this tutorial, we will get to know about the advantages and disadvantages of the agile methodology. We will see what is scrum? and how is it different from agile. Then we will understand the various agile methodologies that are being used by different organizations and how can we implement agile using them. You will also be able to appreciate the difference and also the advantages/disadvantages of these methodologies. There is a constant two-way communication which keeps the customers involved, thus all stakeholders – business and technical – have a clear visibility on the project's progress. Though there are several advantages of Agile methodology, there are certain disadvantages involved in it too. #1) Comprehensive documentation is not preferred which can lead to agile teams incorrectly interpreting this as agile doesn’t require documentation. So the rigor gets lost on documentation. This should be avoided by continuously asking yourself if this is a sufficient information to proceed or not. #2) Sometimes, at the beginning of the projects, the requirements are not crystal clear. The teams might proceed and find that the customers' vision got realigned and in such situations, the teams need to incorporate many changes and it is difficult to gauge the end result as well. There are several agile methodologies in practice across the world. We are going to learn more in detail about four of the most popular ones. Scrum can easily be considered to be the most popular agile framework. The term ‘scrum’ is much considered synonymously to ‘agile’ by most practitioners. But that is a misconception. Scrum is just one of the frameworks by which you can implement agile. The word scrum comes from the sports rugby. Where the players huddle together in an interlocked position pushing against the opponents. Each player has a defined role in their position and can play both offensive and defensive as per the demand of the situation. Similarly, the scrum in IT believes in empowered self-managed development teams with three specific and clearly defined roles. These roles include – Product Owner (PO), Scrum Master (SM) and the development team consisting of the programmers and testers. They work together in iterative time boxed durations called sprints. The first step is the creation of the product backlog by the PO. It’s a to-do list of stuff to be done by the scrum team. Then the scrum team selects the top priority items and tries to finish them within the time box called a sprint. An easier way to remember all of this is to memorize the 3-3-5 framework. It means that a scrum project has 3 roles, 3 artifacts, and 5 events. Roles: PO, Scrum master, and development team. Artifacts: Product Backlog, Sprint Backlog and Product increment. Events: Sprint, Sprint planning, Daily Scrum, Sprint review and Sprint retrospective. We will get to know more in detail about each of these in our subsequent tutorials. Kanban is a Japanese term which means a card. These cards contain details of the work to be done on the software. The purpose is visualization. Every team member is aware of the work to be done through these visual aids. Teams use these Kanban cards for continuous delivery. Just like Scrum, Kanban is also for helping the teams work effectively and promotes self-managed and collaborative teams. But there are differences between these two as well – like during a scrum sprint, the items being worked upon by a team are fixed and we cannot add items to the sprint whereas, in Kanban, we can add items if there is available capacity. This is particularly useful when the requirements change frequently. Similarly, another difference is that while the scrum has defined roles of a PO, scrum master, and development teams, there are no such pre-defined roles in Kanban. Another difference is that while the scrum suggests prioritization of product backlogs, Kanban has no such requirement and it is totally optional. Thus Kanban requires less organization and avoids non-value adding activities and is suitable for the processes which require responsiveness towards changes. Lean is a philosophy that focuses on waste reduction. How does it do that? In lean, you divide a process into value-adding activities, non-value adding activities and essential non-value adding activities. Any activity which can be classified as a non-value adding activity is a waste and we should try to remove that wastage in the process to make it leaner. A leaner process means faster delivery and less effort wasted in tasks which don’t help to achieve the team goals. This helps to optimize every step in the software development cycle. 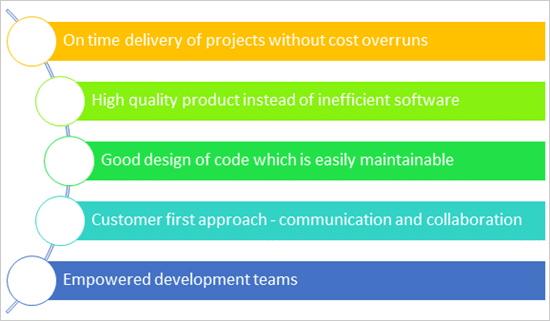 That is why the lean principles were adapted from lean manufacturing into software development. These are quite self-explanatory as their names suggest. Eliminating wastage is the first and most important lean principle and we saw how to do that, we just classify activities as value and non-value add. A non-value add activity can be any part of the code which might make it less robust, increase the effort involved and take up a lot of time while not adding justifiable business value. It can also be vague user stories or poor testing or adding features that are not required in the big picture. The second principle amplifying learning is again easy to understand as a team needs various skills to deliver products in a rapidly changing environment with new technologies cropping up in quick durations. Making late decisions can be rewarding in circumstances where it reduces rework like if there are any changes expected then better delay it so that the team does not have to redo the work as the business needs change. But there is always a trade-off here as the teams need to balance this with the fourth principle of delivering faster. Delaying of decisions should not impact the overall delivery and must not reduce the pace of work. One eye should always be on the complete picture. Having empowered teams is also very common nowadays and this is something that even agile suggests. 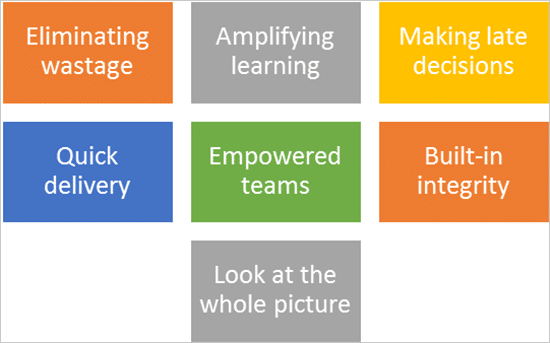 Empowered teams are more responsible and can take decisions faster. The sense of ownership in an empowered team leads to better results. To empower a team, they should be allowed to organize themselves and take decisions on their own. Thus we see that lean and agile have a lot in common with one stark difference – while lean teams can help to refine a product, agile teams are the ones who actually build the product. Extreme programming is another most popular agile techniques. As per extremeprogramming.org, the first XP project was started on March 6, 1996. They also mention that XP impacts software project development in 5 different ways – communication, simplicity, feedback, respect, and courage. These are called the values of XP. Out of these, it all starts with communication. XP teams collaborate with business teams and fellow programmers on a regular basis and start building a code from the very first day. The focus here is on face to face communication as far as possible with the help of the other visual aids. Extreme programmers also build a simple code and start getting feedback on it from the first day itself. The focus is on not going overboard or predicting requirements which have not been shared. This keeps the design simple and produces just the minimum product which will serve the requirements. Feedback helps the team to improve and produce a better quality of work. This helps them build respect for each other as they learn from each other and learn how to share their views. This also gives them the courage as they know that they have gathered everyone’s best ideas and produced a good product with the feedback from others. Thus they are also not afraid to include changes or receive further feedback on their work. This is particularly useful in projects where the requirements are going to change often. Constant feedback will help the teams in including these changes with courage. Thus we have seen the different agile methodologies like Scrum, XP, Kanban and Lean along with their respective advantages and disadvantages. Now, we can easily differentiate between them and also appreciate the subtler differences amongst them. We also learned the fundamentals of each of these methodologies and saw how to apply them in our projects as and when required. In next part, let's understand everything about Scrum. SCRUM is a process in agile methodology which is a combination of the Iterative model and the incremental model. One of the major handicaps of the traditional Waterfall model was that – until the first phase is complete, the application does not move to the other phase. And by chance, if there are some changes in the later stage of the cycle, then it becomes very challenging to implement those changes, as it would involve revisiting the earlier phases and redoing the changes. No huge requirement documents, rather have a very precise and to the point stories. The cross-functional teams work together as a single unit. Close communication with the user representative to understand the features. Has a definite timeline of maximum one month. Instead of doing the entire “thing” at a time, Scrum does a little of everything at a given interval. Resources capability and availability are considered before committing anything. To understand this methodology well, it’s important to understand the key terminologies in SCRUM. Scrum team is a team comprising of 7 with + or – two members. These members are a mixture of competencies and comprise of developers, testers, database people, support people etc. along with the product owner and a scrum master. All these members work together in close collaboration for a recursive and definite interval, to develop and implement the said features. SCRUM team sitting arrangement plays a very important role in their interaction, they never sit in cubicles or cabins, but a huge table. Sprint is a predefined interval or time frame in which the work has to be completed and make it ready for review or ready for production deployment. This time box usually lies between 2 weeks to 1 month. In our day to day life when we say that we follow 1-month Sprint cycle, it simply means that we work for one month on the tasks and make it ready for review by the end of that month. Scrum Master is the facilitator of the scrum team. He/she makes sure that the scrum team is productive and progressive. In case of any impediments, scrum master follows up and resolves them for the team. SCRUM Master is the mediator between the PO and the team. He/she keeps the PO informed about the progress of the Sprint. If there are any roadblocks or concerns for the team, discusses with the PO and gets them resolved. Like the team's Daily Standup, a standup of the SCRUM Master with the PO happens every day. Recommended read => How To Be a Good Team Mentor, Coach and a True Team-Defender in an Agile Testing World? A Business Analyst plays a very important role in SCRUM. This person is responsible for getting the requirement finalized and drafted in the requirement docs (based on which the user stories are created). If there are any ambiguities in the User Stories / Acceptance criteria, he/she is the one who is approached by the technical (SCRUM) team and he then takes it up to the PO or else if possible resolves on his own. In large scale projects there may be more than 1 BA but in small-scale projects, the SCRUM Master may be acting as the BA as well. It is always a good practice to have a BA when the project kick starts. User stories are nothing but the requirements or feature which has to be implemented. As an Admin I want to have a password lock in case the user enters an incorrect password for 3 consecutive times to restrict unauthorized access. There are some characteristics of user stories which should be adhered. The user stories should be short, realistic, could be estimated, complete, negotiable and testable. A user story is never altered or changed in the middle of the Sprint. It is the responsibility of the SCRUM Master and the BA (if applicable) to make sure that the PO has drafted the User Stories correctly with a proper set of the Acceptance Criteria”. If any changes which will impact the sprint release are to be made, then such stories are pulled out of the sprint or they are done as per the hours available. Every user story has an acceptance criterion which should be well defined and understood by the team. Acceptance criteria details down the user story that provide the supporting documents. It helps to further refine the user story. Anybody from the team can write down the acceptance criteria. Testing team bases their test cases/conditions on these acceptance criteria. Just try to relate it with life, imagine you are going for a vacation. As you are going next week, you have everything in place like your hotel bookings, sightseeing, travelers check etc. But what about your vacation plan for next year? You only have a vague idea that you may go to XYZ place, but you have no detailed plan. An Epic is just like you next year’s vacation plan, where you just know that you may want to go, but where, when, with whom, all these details you have no idea at this point of time. In a similar way, there are features which are required to be implemented in future whose details are not yet known. Mostly a feature begins with an Epic and then is broken down to stories which could be implemented. During the planning meeting (see next section), one user story is taken from the product backlog, then the team does the brainstorming, understands it and refines it and collectively decides which user stories to take, with the intervention of the product owner. Story points are a quantitative indication of the complexity of a user story. Based on the story point, estimation and efforts for a story are determined. A story point is relative and not absolute. In order to make sure that our estimate and efforts are correct, it’s important to check that the user stories are not big. The more precise and smaller is the user story, the more accurate will be the estimation. If you give 1 / 2 / 3 story point it means that the story is small and of low complexity. 13 and 21 are highly complex. Here complexity consists of both development plus testing effort. To decide a story point, brainstorming happens within the scrum team and the team collectively decides a story point. It may happen that the development team gives a story point of 3 to a particular story, because for them it may be 3 lines of code change, but the testing team gives 8 story point because they feel that this code change will affect larger modules so the testing effort would be larger. Whatever story point you are giving, you have to justify it. So in this situation, brainstorming happens and the team collectively agrees to one story point. The dependency of the story with other application/module. The skill-set of the resource. The complexity of the story. Acceptance criteria of the user story. If you are not aware of a particular story, don’t size it. Whenever a story is = or > 8 points, it is broken down into 2 or more stories. Burn down chart is a graph which shows the estimated v/s actual effort of the scrum tasks. It is a tracking mechanism by which for a particular sprint the day to day tasks are tracked to check whether the stories are progressing towards the completion of the committed story points or not. 2 resources actual working on the sprint. “Story”-> This column shows the user stories taken for the sprint. “Task” -> This column shows the list of the task associated with the user story. “Effort” -> This column shows the effort. Now, this measure is the total effort to complete the task. It does not depict the effort put in by any specific individual. “Day 1 – Day 10” -> This column(s) shows the hours which are left to complete the story. Please see that the hour is NOT the hour which is already done BUT the hours which are still left. “Actual Effort Left” -> As the name suggests, is the effort actually left to complete the story. It may also happen that the actual efforts increases or decreases than the estimated one. You can use the in built functions and Chart in Excel to create this burndown chart. Enter all the stories ( Column A5 – A15). Enter all the Tasks ( Column B5 – B15). Enter the Days ( Day 1 – Day 10 ). Enter the starting efforts (Sum the tasks C5 – C15 ). Apply the formula to calculate the “Estimated Efforts” for each day (Day 1 to Day 10). Enter the formula at D15 (C16-$C$16/10) and drag it for all the days. For each day, enter the actual efforts. Enter the formula at D17 (SUM (D5:D15)) for summing up the actual efforts left, and drag it for all the other days. For Example: For a particular sprint: the total number of user stories are 8 having story points as shown below. A Sprint is marked as Done when all the stories are completed, all dev, research, QA tasks are marked ‘Completed', all bugs are fixed-closed else the ones that can be done later (like not completely related or are less important) are pulled out and added in the backlog, the code review and unit testing is completed, the estimated hours have met the actual hours put up in the tasks and most importantly a successful demo has been given to the PO and the stakeholders. A planning meeting is the starting point of Sprint. It is the meeting where the entire scrum team gathers, the SCRUM Master selects a user story based on the priority from the product backlog and the team brainstorms on it. Based on the discussion, the scrum team decides the complexity of the story and sizes it as per the Fibonacci series. The team identifies the tasks along with the efforts (in hours) which would be done to complete the implementation of the user story. Many a time, the planning meeting is preceded by a “Pre-Planning meeting”. It’s just like a homework which the scrum team does before they sit for the formal planning meet. The team tries to write down the dependencies or other factors which they would like to discuss in the planning meeting. As the name suggests, these are the actual work done by the scrum team to accomplish their task and take the user story into the “Done” state. What did the team member do yesterday? What did the team member plan to do today? It is the Scrum master who facilitates this meeting. In case, any team member is facing any kind of difficulties, the scrum master follows up to get it resolved. In Stand ups, the board is also reviewed and in itself shows the progress of the team. At the end of every sprint cycle, the SCRUM team meets again and demonstrates the implemented user stories to the product owner. The product owner may cross verify the stories as per its acceptance criteria. It’s again the responsibility of the Scrum master to preside over this meeting. Also in the SCRUM tool, the Sprint is closed and the tasks are marked done. The retrospective meeting happens after the review meeting. What went well during the Sprint (Best practices)? What did not go well in the Sprint? The Scrum team should continue to follow the best practice, ignore the “not best practices” and implement the lessons learned during the consequent sprints. The retrospective meeting helps to implement the continuous improvement of the SCRUM process. Having read about the technical jargons of SCRUM. let me try to demonstrate the whole process with an example. Step #1: Let’s have a SCRUM team of 9 people comprising of 1 product owner, 1 Scrum master, 2 testers, 4 developers and 1 DBA. Step #2: The Sprint is decided to follow a 4 weeks cycle. So we have 1-month Sprint starting 5th June to 4th of July. Step #3: The Product owner has the prioritized list of user stories in the product backlog. Step #4: The team decides to meet on 4th June for the “Pre Planning” meeting. The product owner takes 1 story from the product backlog, describes it and leaves it to the team to brainstorm on it. The entire team discusses and communicates directly to the product owner to have clearly understood the user story. In a similar way, various other user stories are taken. If possible, the team can go ahead and size the stories as well. Identify their individual tasks for each story. Calculate the exact number of hours on which they will be working. Let's check how the member concludes these hours. Minus 1 hour for a break, minus 1 hour for meetings, minus 1 hour for emails, discussions, troubleshooting etc. So the actual working hours = 6. A total number of working days during the Sprint = 21 days. Total number of hours available = 21*6 = 126. Number of actual hours = 126 – 12 = 114 hours. This means that the member will actually be available for 114 hours for this sprint. So he will break down his individual sprint task in such a way that a total of 114 hours is reached. Step #5: On the 5th of June the entire Scrum team meets for the “Planning Meeting”. The final verdict of the user story from the product backlog is done and the story is moved to the Sprint Backlog. For each story, each team member declares their identified tasks, if required they can have a discussion on those tasks, can size or resize it (remember the Fibonacci series!!). The Scrum master or the team enter their individual tasks along with their hours for each story in a tool. After all the stories are completed, Scrum master notes the initial Velocity and formally starts the Sprint. Step #6: Once the Sprint has started, based on the tasks assigned, each team member starts working on those tasks. Step #8: The scrum master tracks the progress on a daily basis with the help of “Burn down chart”. Step #9: In case of any impediments, the Scrum master follows up to resolve those. Step #10: On 4th July, the team meets again for the review meeting. A member demonstrates the implemented user story to the product owner. Step #12: On 6th July, the Team again meets for pre-planning meeting for the next sprint and the cycle continues. There are several tools that can be used extensively for tracking the scrum activities. In the upcoming tutorial, we would be shedding light on the Agile Manifesto which is a notion that drives effective Agile Teams. About the author: Thanks to STH author Shruti Shrivastava for compiling this series. example is really useful. thanks for sharing. Thanks a lot for Explaining Scrum methodology in a easier way !! Crystal clear and easy to understand . Great work , thanks. Can you provide test plan template for Agile project. Assigned to Agile project, had a day training for Agile. What a co incidence, its agile guide in front of me. The document is very much useful, thanks for sharing the document. It’s very good article and learn a lot from this article. A very informative article yet to the point. Thanks for sharing. Nice Article..Point to Point to article..
very nice….learn a lot . Very simple yet accurate .thanks for sharing. This is the best site to learn and understand software testing. Just browse and go through this site and I bet you will learn a lot, from basic concepts to advance ones. Nice way of explaining the process. The graph and sheet really helped me alot. I have a question, so what is the concept behind using the Fibonacci series? Why not any other estimation technique? Thanks a lot for your post it has been very useful. Right now I’m looking to implement Agile on my place of work so I’m looking for techniques, steps or whatever help possible to easy up the adoption of it. Appreciate your help with any suggestion. A very informative tutorial to start up with. This is the first article that I gain so much knowledge about the Agile. Moreover, it’s easy to understand and imagine where we are in Agile team. Simple and Easy words used to Understand Scrum methodology…Keep up doing the same work. Can u explain why user story is assigned a story point based on the Fibonacci series (1, 2, 3, 5, 8, 13&21). This article has been very effective in providing me an insight on agile and its related concepts. The idea has been elaborately explained with examples wherever required. What is this? you are running software testing website and the design issue is this you cannot handle. Please, resolve this issue. Way of explanation is very effective. I am thankful for your Great article. It is very very useful for me. Great effort Shilpa, Very useful and easy to understand. Worth Reading. Really detailed and very well explained article I’ve ever seen about agile methodology. Why/how user story is assigned a story point based on the Fibonacci series? Simply understandable and thanks a lot . Thank you for sharing . It is interactive ,explained very well with the examples . nice explanation….better understanding for beginners. Nice explanation, it is really usefull. Can you send Test Plan and test case template template for the Agile process…? I want to ask 1 question. if there are 5 team members a,b,c,d and e each of them working 6 hrs daily,but d works only 3hrs daily.B was on leave for 2 days.and sprint is for 2 weeks.then what will be the total no of hr in that sprint?